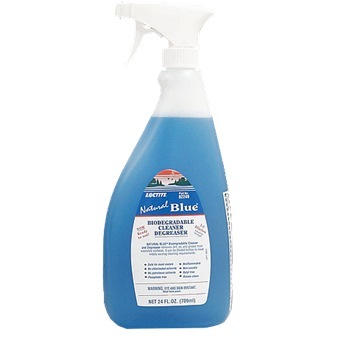 Loctite ® Natural Blue ® Biodegradable Cleaner & Degreaser. All purpose, industrial strength, concentrated cleaner and degreaser. Can be economically diluted with water. Natural Blue ® is formulated for wipe down, pressure spraying, and immersion cleaning processes, at room temperature or heated. Contains no ozone-depleting chemicals (ODCs).